It can't be that easy, can it? Was that the correction? The markets melted up yesterday and upside momentum remains strong (though volume was a little lacking). I am inclined to give the bull case the benefit of the doubt for now, though I am maintaining a risk control discipline of tight and trailing stops. Despite my worries about the sustainability of China's growth model, I have to listen to the message of the market. With the stock markets of all three global economic blocs exhibiting bullish technical patterns, I have to give in to the Dark Side yet one more time and temporarily set aside my concerns about these overbought and exuberant markets and stay long, albeit with tight stops. Sometimes things are so bad it can't get any worse. That seems to be case in the eurozone, which is mired in deep recession and possibly a multi-year depression. 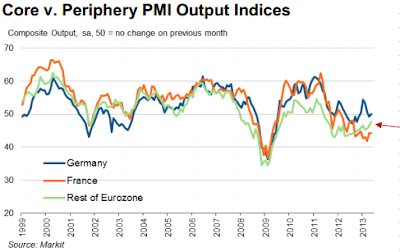 Today we got the latest PMI numbers from the Eurozone (see figure 2). France is clearly struggling and Germany’s growth has been slower than many had hoped – due primarily to global economic weakness. But take a look at the rest of the Eurozone. While still in contraction mode, it shows an improving trend. Spain printed a trade surplus last month (surprising some commentators), which may be a signal to rethink how valid some of these forecasts really are. 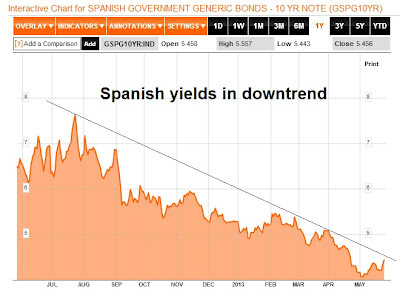 Nobody is suggesting we will see Spain or Portugal all of a sudden begin to grow at 5%. But given the extremely pessimistic sentiment of many economists (a contrarian indicator), it is highly possible we are at or near the bottom of the cycle. People should not be surprised if we start seeing some positive growth indicators – especially in the periphery nations – in the next few quarters. From a longer term perspective, the elephant in the room continues to be France (see my previous post Short France?). French economic performance continues to negatively diverge with Germany. This isn't Greece or Ireland, whose troubles could be papered over. France is the at the heart of Europe and the Franco-German relationship is the political raison d'etre for the European Union. France cannot be saved. It can only save itself. I am watching this carefully. European stocks could turn out to be the new emerging leadership and the source of outperformance. All of these conditions are lining up to suggest that commodities are poised to rebound. The euro, commodity sensitive currencies and gold are all at key technical support levels. As I write these words, precious metal prices are substantially in the red. 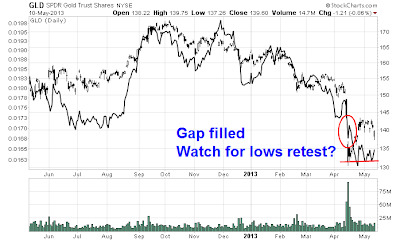 Watch for signs of stabilization, or better yet, reversal on the day. If that were to happen, expect that the rotation back into cyclical sectors will continue and stock prices to continue to grind higher. I was partly right. Gold appears to be turning around here, though it is more correlated with the safety trade than the risk trade. 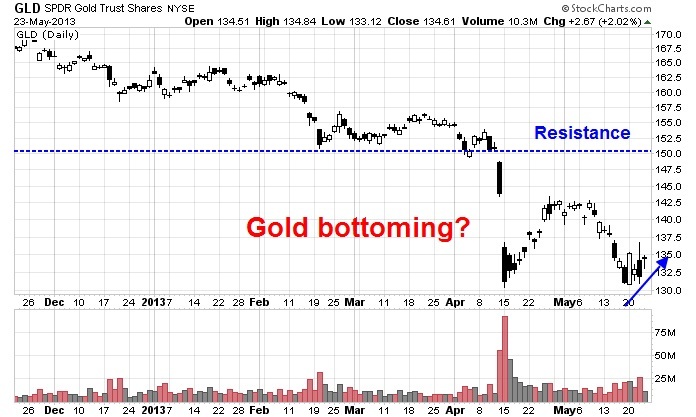 The chart of GLD below shows a constructive bottoming process, with overhead resistance at about the 150 level. 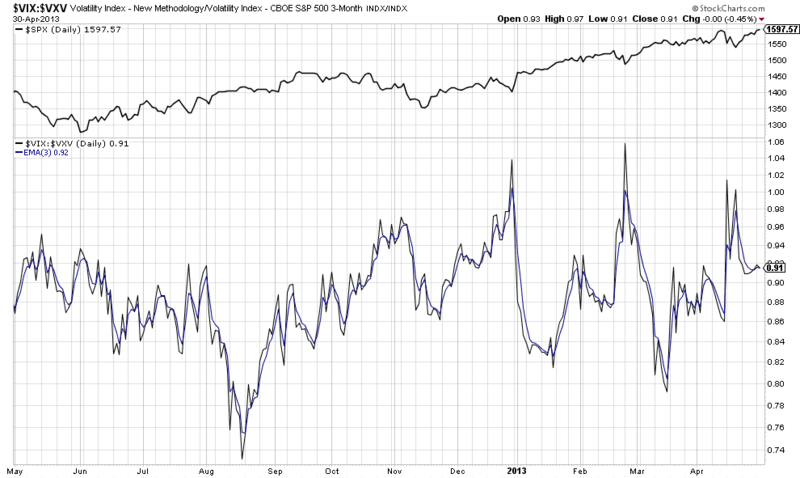 On the other hand, the rotation into deep cyclicals hasn't fully developed yet. Consider copper as an example. The red metal has rallied through a downtrend and seems to be consolidating sideways. Other industrial metals remain in a downtrend, though. And oil prices, as measured by Brent global oil price benchmark, are still in a downtrend and has not participated yet in a commodity upswing. Though natural gas seems to march to beat of its own drummer as it staged an upside breakout, driven by positive fundamentals. I remain constructive on the rotation into the deep cyclicals. Despite the market's freakout over Bernanke's off the cuff remarks* about the possibility that the pace of QE might be tapered, followed by a poor HSBC manufacturing PMI out of China and Japanese stocks cratering by 7% (though they are recovering as I write these words), the technicals for the cyclical trade looks intact. Consider this relative performance chart of the Morgan Stanley Cyclical Index (CYC) against the market. These stocks held up well in light of the mini-panic over the last couple of days. Today is May 22, 2013. The general market declined by less than 1% (0.82% to be exact) and my phone has been blowing up with panic by people who are IN the market!!! My trading friends are either calling or texting me with serious worry, and even a few stories of mini “blow-ups” today. I’ve never seen anything like this in my 17 year career! God help these people when (not if) we get a serious correction. Jeff deGraaf, technician extraordinaire (formerly of Lehman now at Renaissance Macro Research) makes an interesting observation about the heavily overbought markets. Last week, the S&P500 had ~93% of all stocks trading over their 200 day moving average. Normally, this degree of overbought should lead to a correction. As you can see in the inset box, it sometimes does. However, if you are looking out a year, we see that over the past 3 instances, markets have been higher. Is the market overbought? Yes. But these conditions constitute what my former Merrill Lynch colleague Walter Murphy termed a "good overbought" condition. * Paul Volcker once remarked that as Fed Chairman, he was so guarded about his public remarks that if he went to a restaurant, he would say, "I'll have the steak, but that doesn't mean that I don't like the chicken or the lobster." Much has been made of the upside technical breakout experienced by the US Dollar last week, but when I dissect the components of USD strength, I found that much of the breakout was attributable to Yen weakness. In fact, the other components of USD are all testing support, which suggests that the euro and commodities are poised to rally here. So is its cousin, the Canadian Dollar. In fact, if you were to consider the EURAUD cross as a measure of the strength of Europe, the euro is turning up against the commodity sensitive Aussie Dollar as it has staged an upside breakout through a resistance level. Viewed in that context, is the euro that weak or is it just weak against the USD? As I have shown, most of the other components of the USD Index other than the Yen are sitting on technical support. I also wrote to watch for the re-test of the recent bottom in gold as a clue to market direction (see The golden canary in the coalmine). As the chart below shows, GLD hit that technical re-test level on Friday and the silver/gold ratio is stabilizing indicating that most of the blind panic selling of gold is over. As the major US averages grind to more new highs, I am seeing signs of confirmed upside breakouts everywhere. Consider, for example, this relative performance chart of SPY against IEF, which is the ETF for 10-year Treasuries. The ratio staged an upside breakout on the weekly chart, with relative resistance a some distance away indicating considerable upside potential for stocks. And then there's Greece. 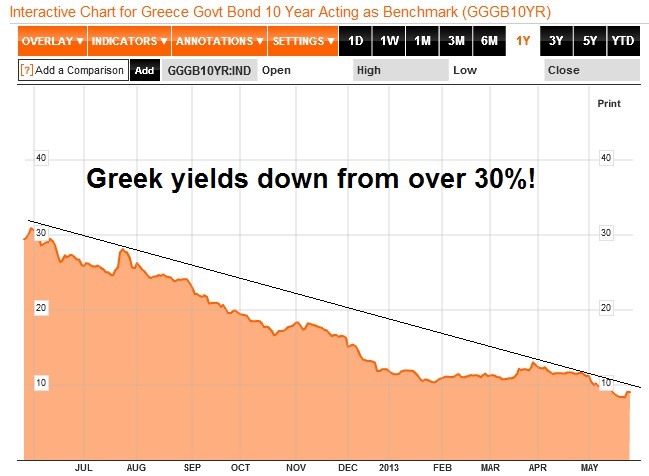 Yes, remember that Greece? The Greece whose rating that Fitch recently upgraded. Greek commercial refrigeration and glass bottle producer Frigoglass’s debut bond sale is the latest sign investors are growing more optimistic about Greece, the company’s chief executive said in an interview with Dow Jones Newswires Tuesday. Frigoglass Monday sold a €250 million ($324.3 million) five-year bond–the second debt sale from a Greek company in as many weeks as the country’s corporate bond market emerges from a deep freeze. The AUDCAD currency cross, where Australia is more China sensitive and Canada more US sensitive, looks downright ugly. In the US, Ed Yardeni pointed out that forward Street consensus earnings growth is showing signs of stalling. 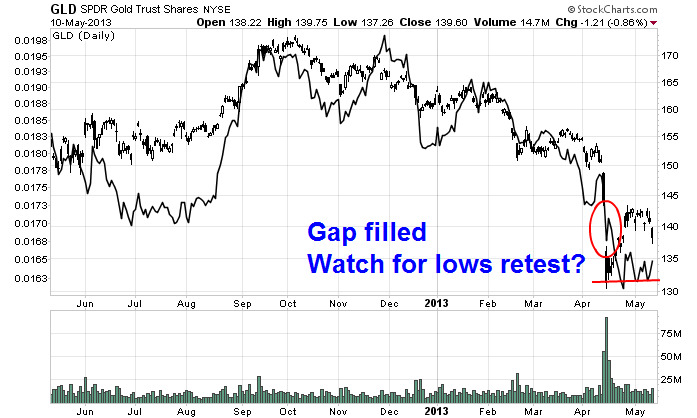 While this isn't a bearish signal yet, it does bear watching. Should forward estimates growth turn negative, it would create considerable headwinds for equities. My takeaway from the current environment of powerful stock momentum is, "It's ok to get long, but don't forget to look over your shoulder and maintain a tight risk control discipline." No doubt the markets will get spooked by this "leak" and as I write these words, ES futures are moderately in the red. The question is, "How much and how far?" For me, the canary in the coalmine is the gold price, which is highly sensitive to expectations of monetary stimulus. Gold has staged a tactical V-shaped bottom and the silver/gold ratio has stabilized, which is constructive (see Watching silver for the bottom in gold). 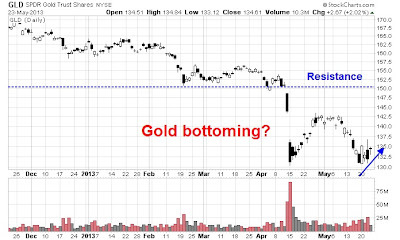 Gold rallied to fill in the gap left by its free fall in April - so now what? With the news that the Fed is starting to think about an exit from QE, the near term downside risk is evident. There are many opinions about the fallout of this "leak". Josh Brown has two sides of the story. On one hand, he believes that with sentiment excessively bullish, we are tactically headed for a hard correction. On the other hand, he seems more relaxed longer term. As for myself, I am watching for a re-test of the April lows in gold to see if that low can hold as a sign for the risk-on trade. Longer term, the April decline caused considerable short-term technical damage, but the long-term uptrend remains intact. The other key issue is whether the uptrend can hold here. A Lost Decade or a "beautiful deleveraging"? Will this Fed action be a repeat of the Japanese experience where the authorities go through ease-tighten cycles that caused ups and downs in stock prices? 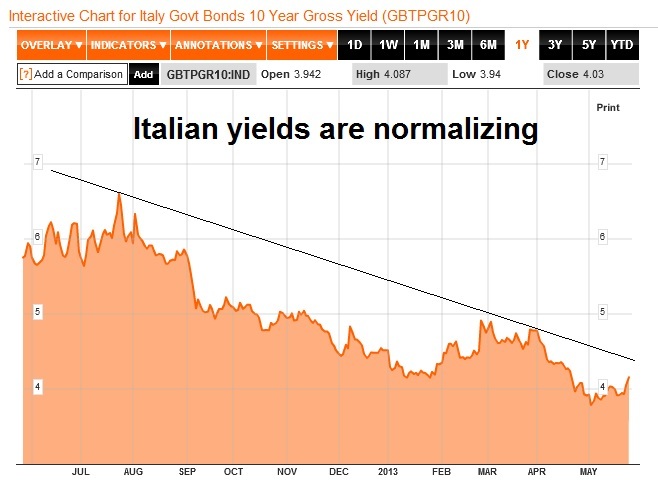 This will be a test of Ray Dalio's beautiful deleveraging thesis where the United States has undertaken just the right mix of austerity, money printing and debt restructuring. My view is that there is no such thing as a free lunch, not even for governments or central banks. Any action taken may have benefits, but also imposes costs, even if those costs are imposed upon others. So it is for the Fed. At the beginning of 2008, they had a small, clean, low duration (less than three years) balance sheet on assets. Today the asset side of their balance sheet is much larger, long duration (over 6 years), negatively convex, and modestly dirty as a result. We’ve just been through 4.5 years of Fed funds / Interest on reserves being below 0.5% — this is a far greater period of loose policy than that of 1992-1993 and 2002 to mid-2004 together, and there is no apparent end in sight. This is why I believe that any removal of policy accommodation will prove very difficult. The greater the amount of policy accommodation, the greater the difficulties of removal. Watch the fireworks, if/when they try to remove it. And while you have the opportunity now, take some risk off the table. It is possible a steep decline in financial assets would ensue with the lowest part of the capital structure being hurt the most. The Fed has chased investors all in the same direction; into risk-seeking securities. Few care about “right-tail” events, but should investors decide to pare risk in reaction to a hint of ‘tapering’, the overshoot to the downside may surprise many. The combination of too many sellers, too few buyers, and dreadful (and declining) liquidity means a down-side overshoot is highly likely. It would provide the Fed with their answer as to whether they have been creating market bubbles. We use a variety of models and methods; for example, we use empirical models of default risk and risk premiums to analyze credit spreads in corporate bond markets. These assessments are complemented by other information, including measures of volumes, liquidity, and market functioning, as well as intelligence gleaned from market participants and outside analysts. In light of the current low interest rate environment, we are watching particularly closely for instances of "reaching for yield" and other forms of excessive risk-taking, which may affect asset prices and their relationships with fundamentals. It is worth emphasizing that looking for historically unusual patterns or relationships in asset prices can be useful even if you believe that asset markets are generally efficient in setting prices. For the purpose of safeguarding financial stability, we are less concerned about whether a given asset price is justified in some average sense than in the possibility of a sharp move. The Fed being aware of a problem is the first step. Whether they can either react, either preemptively or after the fact, in the correct manner is another problem. I prefer to watch the golden canary in the coalmine to see how the markets react, or over-react to the news that the Fed is mapping out a plan to gradually withdraw from quantitative easing. Now that cyclical (and growth oriented) sectors have surged relative to the defensive sectors, the Value stocks have similarly pulled back against Growth stocks. The chart below of the Russell 1000 Value Index relative to the Russell 1000 Growth Index shows that the relative uptrend of Value vs. Growth is still intact. If my analysis of Value vs. Growth is the more appropriate framework, then it may be time to start buying Value now (and it may represent the third way in the cyclical vs. defensive sector debate of whether the cyclical rebound is a fakeout or true revival). As US equities have rallied in the last couple of weeks, there has been much discussion about the rotation in sector leadership from defensively oriented sectors to the deep cyclical sectors. Does the rotation mean that this market is truly ready to take off to further new highs? What does it all mean? I have spent a fair amount of time pondering that question (see my recent post Sell in May?). 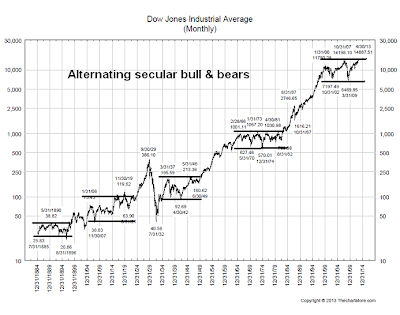 My conclusion is where you come down on the question of whether this is the start of a new secular bull market where stocks move to new highs or whether we are just seeing the top of a range-bound secular bear. To explain, consider this long-term chart of the Dow, where the market has seen alternating secular bulls, where stocks rally to multi-decade highs, and secular bears, where the market remains range-bound for years. My main belief is that we remain in a secular bear for two main reasons: demographics and valuation. I have written about the demographics issue before (see Demographics and stock returns and A stock market bottom at the end of this decade). For stocks to go up, there has to be more buyers than sellers at a given price. The propensity of Baby Boomers, as they move into retirement, is to take money out of stocks. In order for equities to rise, those negative fund flows have to be met by the retirement savings of their children, the Echo Boomers. Two research groups looked into this topic (see papers here and here). Their conclusion - the inflection point at which the fund flows of Echo Boomers moving into stocks start to overwhelm the Baby Boomers taking money out is somewhere between 2017 and 2021. In addition, long-term valuations don't appear compelling. 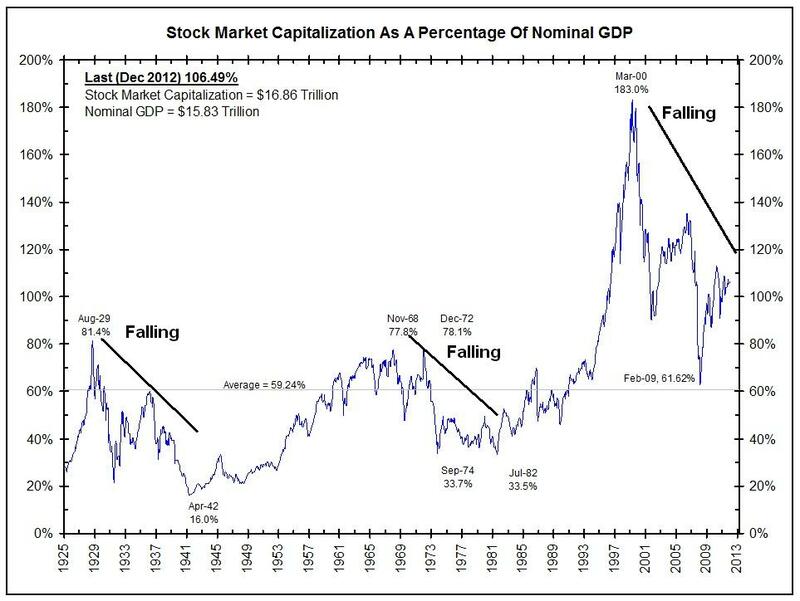 I have long considered the market cap to GDP ratio as a proxy for an aggregate Price to Sales ratio for the stock market. The chart below from Bianco Research via Barry Ritholz, shows this metric, whose history goes all they way back to 1925, to be well above its long-term average. In addition, note that instances of falling market cap to GDP ratios correspond with secular range-bound bear markets. Another reason for the long-term secular bear case comes from John Hussman, an investor for whom I have much respect. His latest 10-year return projections for the SPX is about 3.5% (see My answer to John Hussman). Even with bonds yields at microscope levels, a 3.5% return expectation for US equities is nothing to get overly excited about. The bull case (and it's always important for investors to consider opinions contrary to his own) is represented by Ray Dalio's "beautiful deleveraging" concept (see my post Falling tail risk = new secular bull?). Dalio believes that the United States has undergone a "beautiful deleveraging" process in the wake of the financial crisis of 2008. A "beautiful deleveraging" involves just the right amount of austerity, debt restructuring and money printing. He went on to observe that, by contrast, Europe has gotten it all wrong and that region is likely to be mired in a Lost Decade. If Dalio is correct, then the rotation that we are observing from defensive to cyclical sectors is another sign of a new upleg in equity prices and therefore the start of a new secular bull. While my analysis of the secular bull vs. bear is based on a long-term multi-year investment time frame, what about the intermediate term time frame for the next several weeks to months? Here's what's bothering me about the emergence of the cyclical leadership. First of all, commodities look positively sick. Here is a chart of the industrial metals. Does this look like the basis for a cyclical rebound? 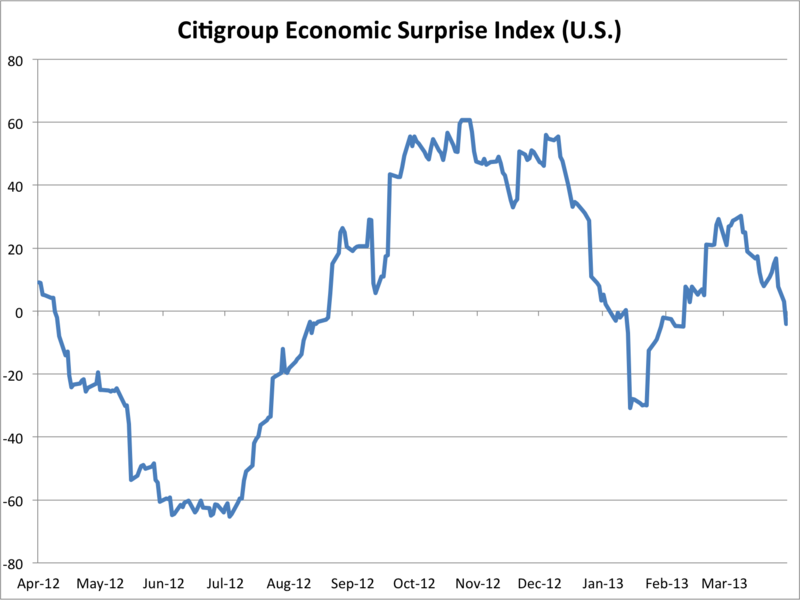 In addition, the Citigroup Surprise Index has been turning down, both in the US and globally. Despite Friday's NFP upside surprise, the internals of the employment report appeared to be negative and it was before long that there were a cacophony of voices pointing out the weaknesses in the report (for examples, see here, here and here). I think we are getting real close to a major inflection point. It seems like every macro-economic data point I come across is saying one thing – the same thing. There is an extremely high correlation between all the varying data points and indicators. Data like the 10yr treasury yields, PMI manufacturing, durable goods orders, copper prices, international (ex Japan) stock markets, inflation expectation, margin levels etc – are all saying that the (global &) US economy is slowing, and that the risks of deflation/contraction/recession are growing. The only thing diverging from this pattern in all of the charts below is the US equity markets. There are two extreme scenarios that can “correct” the above divergence, although I believe it will be a combination of the two. 1 – We could see a correction of 15-20% that would put the US equity markets back in line with most of the charts above. It would then be priced closer to fair value based on most of the recent economic data. 2 – The economic data can pop back up. Whether it was because of the payroll tax increase, sequestration, or some other seasonal event(s)… maybe this is/was just a blip on the radar these last few months, and the economic data will “catch up” to the US equity markets. If these scenarios were mutually exclusive, I would bet the farm on #1. A realistic base case assumption though, is a combination of the two. 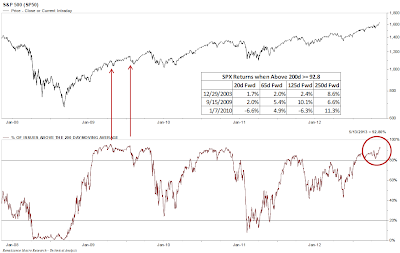 I am anticipating a good 10% correction combined with a small pickup in some of the macro data. Either way, something’s gotta give. The level of divergence here is bordering historical, and the relative and absolute over-valuation of some of these high-yield names are frightening. With Europe mired in recession, commodity markets signaling that Chinese growth is stalling, the US is once again holding up the world. If the American economy is holding up the world, then why is US equity performance faltering against global equities? The chart below shows the relative performance of SPY against ACWI (All-Country World Index). If we are indeed seeing a launch of a new secular bull, shouldn't the US, which has been the beneficiary of the "beautiful deleveraging", be leading? While I have outlined my bias for the bear case, investing is about probabilities and I honestly don't know how this market is going to resolve itself. While the bear case is compelling, Street earnings and revenue estimates continue to get revised upwards (as per Ed Yardeni). Until we see some sort of negative macro surprise that cause estimates to get revised downwards, the stock market is likely to grind higher. As I wrote last week, there is no catalyst yet for a bearish impulse for stocks yet. Given the dominant weight of Apple in the Technology sector, consider the relative performance of an equal weighted Tech index. the equal-weighted NASDAQ 100 (QQEW) against the SPX. 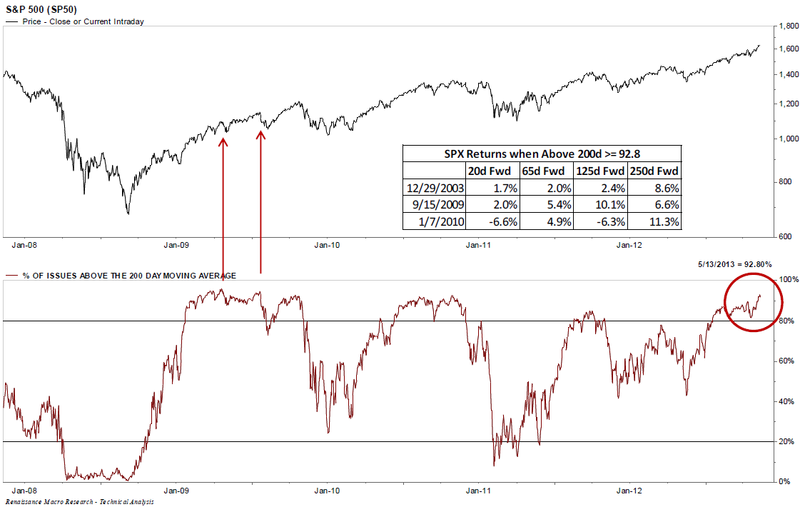 While the XLK has rallied out of a relative downtrend against SPX, QQEW remains range-bound against the market. In other words, the average Tech stpcl has performed in line with the market in general. So if you start to get excited about the potential rally in Technology stocks, pick the appropriate benchmark and know what you are betting on. I think it's the most convincing book I've read so far that links the mechanisms of the recent crisis to crises in the past. In effect, he argues that the crisis was the direct result of the uncontrolled creation of money by the shadow banking sector, and ultimately took place as a classic bank run, no different from runs in the past, except that this run took place mostly out of public view because it didn't involve ordinary bank deposits. The new kind of money in this bank run was stuff such as repo agreements and commercial paper which played the role of money for financial institutions. In 2007-2008, when lenders lost confidence (for good reason) in the mortgage-backed collateral backing this money, they demanded that money back, and the financial system seized up. Think of economists and bank regulators looking out at the financial landscape prior to the financial crisis. What did they see? They did not see the possibility of a systemic crisis. Nor did they see how capital markets and the banking system had evolved in the last thirty years. They did not know of the existence of new financial instruments or the size of certain money markets. They did not know what "money" had become. They looked from a certain point of view, from a certain paradigm, and missed everything that was important... The blindness is astounding. That economists did not think such a crisis could happen in the United States was an intellectual failure. It seems to me that there is a certain amount of denial among economists. I have noticed, in talking about the ideas in this book with my economist colleagues, that there is a fairly clear generational divide on this. To younger economists and graduate students, it is obvious that there was an intellectual failure. Some older economists are inclined to hem and haw, resorting to farfetched rebuttals. It is clear that this is a sensitive issue, as like banks no one wants to have to write down the value of their capital. ...One other thing of interest. Gorton in a late chapter, when discussing the spectacular failure of the rational expectations paradigm, quotes University of Chicago economist James Heckman, winner of the economics' Nobel Prize (yes, that's not its actual name) in 2000, from an interview he did with John Cassidy in 2010. Why didn't economists saw the financial crisis coming? What happened to rational expectations? Think of the kind of market that Adam Smith described. You can get a lot of insight into how just the right amount of bread gets to London in the morning by assuming that the baker and the other participants in the market pursue their own interests in a sensible manner. The rational-agent model takes this idea to its logical extreme. If you want to predict the behavior of a market, you are best off assuming individual agents who act in a way that is predictable and fairly simple—for example by assuming that the participants are similarly motivated and exploit all their opportunities. I am not an economist, but I find it hard to imagine that they will ever give up the use of schematic individual agents, even if they endow these agents with a little more realistic psychology. And I see no reason why they should. The rational agent model has more questionable consequences in the domain of policy because the assumption that individuals are rational in the pursuit of their interests has an ideological coloring and policy implications that many would view as unfortunate. If individuals are rational, there is no need to protect them against their own choices. At the extreme, no need for Social Security or for laws that compel motorcycle riders to wear helmets. It is not an accident that the department of economics at the University of Chicago, one of the most illustrious in the world, is known both for its adherence to a strict version of the rational actor model and for very conservative politics. Rational expectations: Is this an anomaly? Now ask yourself, how much has the United States government spent on combating terrorism compared to heart disease, cancer and automobile accidents? If this had been academic finance literature, then these mis-pricing or mis-allocation of resources would be termed an anomaly, much like low P/E or small capitalization were deemed to be market anomalies in the 1970's. Here's another thought from the Chicago school: If the world needed to be rid of terrorism, or __________ [insert the dictator of your choice], wouldn't the market have done it? Behavioral finance is the school of thought that tries to understand human behavior in the context of what "should" be rational expectations. I have long believed that technical analysis is a branch of behavioral finance. I recently wrote an essay about the evolution of thinking about technical analysis and why it works. You can read it here. Further to my last post (see Sell in May?) 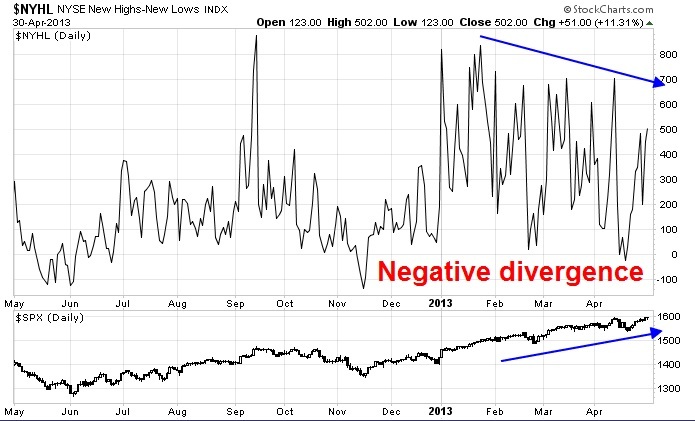 I am seeing more negative divergences that create more concerns for the bull case. The recent rally, which has been led by the golds and deep cyclicals, have all the appearances of a dead cat bounce rather than the start of a sustainable advance. But what about silver? Sure, this poor man's gold rallied, but the rebound has been weak and the gap was not filled, which suggests to me that this advance is an oversold rally and the next major move in precious metals is likely to be down. In my previous post, I also wrote about watching the AUDCAD currency cross rate, with the premise that the Australian Dollar is more sensitive to growth in China and the Canadian Dollar is more sensitive to growth in the American economy. A breach of the uptrend in this cross rate would would be a signal that the market's belief that Chinese growth is slowing, which would be negative for the global growth outlook. The breakdown in this currency pair cannot be regarded as good news for the prospects of Chinese growth. Another concern is the disappointing South Korean April exports, which were just released and missed expectations at 0.4% compared to estimates of 2.0%. The South Korean economy is regarded as cyclically sensitive as the country is highly exposed to trade with China and Japan. 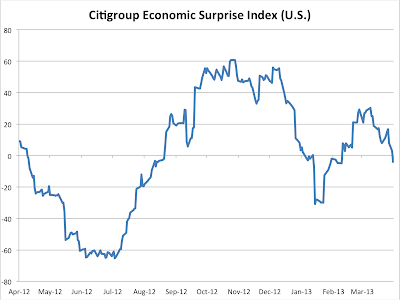 In addition, Cullen Roche at Pragmatic Capitalism recently pointed out that the Citigroup Economic Surprise Index is turning down in every major region in the world. 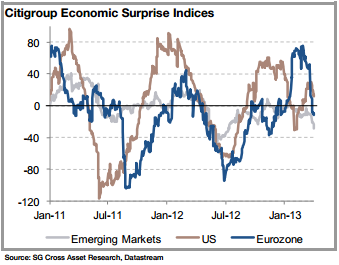 As a reminder, a economic surprise index reading below zero is indicative of more misses than beats on economic data. Falling surprise indices around the world suggests, therefore, that global economic growth is starting to stall. As we wait for the decisions of the Federal Reserve and ECB this week, it will be a test of market psychology of whether bad news is good news, i.e. economic slowdown will lead to central bank stimulus, which is bullish, or bad news is bad news. Moreover, with the SPX making new marginal highs, I am not seeing the breadth confirmations from the 52-week highs and lows. While these kinds of breadth divergences can last for months, it nevertheless raises a red flag about the sustainability of this stock market rally. Here's another puzzle. 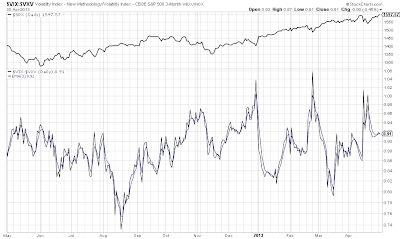 If the stock market is making new highs, why is the VIX/VXV ratio (which I described in a previous post here and first pioneered by Bill Luby, see his original post) sitting at only 0.91, which is barely below my "sell signal" mark of 0.92? What is the term structure of the option market telling us? One final point. I have outlined a number of negative divergences that suggest a bearish tone for stocks, but I have not outlined the timing of any trades. In my last post entitled Sell in May? I sketched out a number of likely triggers for to get more defensive. Since then, I have had a number of emails and other responses asking if and when I would write about when those events are triggered and, by extension, when it's time to sell or short the market. Let me make this very, very clear: Those triggers are just a set of suggested triggers. It will be up to each individual reader to make up his or her own mind as to what to do if and when each event is triggered. Don't expect me to hold your hand and shout "sell" for you. You are responsible for your own portfolio and your own profit and loss statement. For the readers who are waiting for me to tell when to buy or sell, I strongly suggest that you re-read my previous post about why the contents of this blog does not represent investment advice. This blog is a forum for discourse, not pre-digested investment or trading advice.